Black Friday is a great day to save on items for the most part. I had been looking to upgrade my Capresso grinder for a while, and when I saw the sale for $149 on the OXO On Conical Burr Coffee Grinder I couldn’t resist. The main draw for me was the integrated scale. I was pretty sure that it wasn’t going to be super accurate (I was correct), but I was equally sure that it would be good enough (I was correct). The product is endorsed by Charles Babinski, a US Barista Champion and 2nd place finisher in the WBC. Oxo also is one of a handful of companies that makes an SCAA certified brewer. So, with those supporting facts, it was a fairly educated guess that this grinder wasn’t going to be total crap. I already have a very good espresso grinder, so this grinder is going to be used for pourover/drip only. With that in mind, let’s get into the details. The included grinds bin is a static nightmare. Also, the design of the system leaves a significant gap between the container and the chute for grinds to spray around. It’s not stepless. So, you won’t be dialing in the absolute optimal grind. 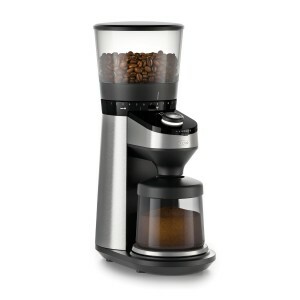 But, again…this isn’t a commercial grinder, and for drip/pourover it works very well. You can easily swap out the included grounds bin for anything you want. A short glass or stainless steel container, or even a Hario cone will fit in there nicely. However, I suggest picking something and sticking with it because re-taring the scale is harder than it should be. Grinding speed is very nice. It’s not a commercial grinder, so don’t expect a dose in 2 seconds, but it seems like it’s at least twice as fast as the Capresso. Grind uniformity is actually pretty great. There are reviews that state the level of fines at the coarser levels was too much, but in the range I’m using (med fine to med coarse), I’m seeing great quality. Auto shutoff when the bean hopper is empty. This feature pretty much changed how I thought I was going to use the grinder. With this feature, you can pre-weigh your dose, and then use the “manual” grind feature. This normally grinds until you stop it…but it will also auto stop when the bean hopper is empty. Bean hopper disconnect has an automatic “shutoff” feature for the beans. That means you can take the hopper off and beans won’t go flying everywhere. Grind retention in the chute is surprisingly minimal. So, if you are looking to up your grinder game without breaking the bank, at $149, the OXO On Conical Burr Coffee Grinder is something I would recommend as a step up from the Capresso Infinity.